Do you think content writing is the most desirable online part-time job? If yes then, it is one of the prime blunders that a person has ever committed in his whole life. There is no doubt that Content Writers earn quite handsome revenue, but they can double their income if they start their own Blog or website. How much a Content writer could earn, hardly $10/article or a maximum $30/ article. Does that is enough; the answer would be an enormous NO. The problem is that they don’t have their own empire to play with because they have committed their whole life for others. To guide content writes on the right side of the path, in this article, we will be discussing some significant reasons that Why a Content Writer Should Start his own blog and starting earning effortlessly. Before we get to towards the conclusion that why Blog authors should start their own website, let us first take a look at the Following difficulties that play a significant role in stopping website authors to start their own website. No Idea about Web Developing: An Article writer always thinks that they have no or extremely less Web developing skills. Therefore, they can’t start their own website. To be honest, there is no need of web developing skills if a person knows how to write content with quality and uniqueness then it’s more than enough. Don’t Know Any Thing About SEO: A content writer always complains that he has no knowledge of search engine optimization. Well, we think there is no need to get too deep because as long as a person is creating Fresh original content then people will automatically link to the article and thus it will increase the SEO automatically. Don’t have Enough Funds: Most of the content writers complain that they don’t have enough earning to afford a hosting. This is one of the most common and the idiotic excuses because nowadays buying a hosting is not a problem anymore. They can use Blogger Platform, which cost nothing, but provides glittering results. It’s all about commitment and hard work. Starting A New Site is Too Tough: We do accept that starting a whole new website is not a child’s play, but it is not that difficult too. It’s all about writing and maintaining patience. Once a website gets popular it will generate revenue automatically. Why a Content Writer Should Start Blogging? Why a Writer should work for himself? Why he should start a blog? All this mind boggling questions could be revolving all-round the brains of content writers. Today in this article, all these questions would be answered. Consider the following meaningful reasons that we have experienced ourselves. Whenever a person purchases anything he has a certain satisfaction that no one else can take that thing for him because he knows that, he is the true and the only owner of it. In a similar fashion, when an article writer starts his own website he has the liberty to do anything about it. However, on the other hand, if something is not yours then in a glimpse all the happiness could be blown away that they never existed. Being a content writer, a person has to face lots of difficulties. He has to complete all the tasks in time, and if he won’t then, his BOSS won’t pay him. A Content writer pretends to be a slave and work for others. Now it’s your choice to build your empire or work for others. If a person earns heaps of dollars, then no one would ever care that from where they are coming from everyone will just enjoy its sight. Writers who work for others have significantly low earning, which makes it extremely difficult for them to live a luxurious life. People say, “Money can’t buy happiness”, but scientifically it’s wrong because the whole world is running just to multiple their earning. A writer who is working for other website could establish his own blog and could earn quite effortlessly. He can even continue his Freelancing, but once his blogs get a kick start he can enjoy the irresistible experience. We are quite sure that his earning would be doubled. Things are pretty clear. 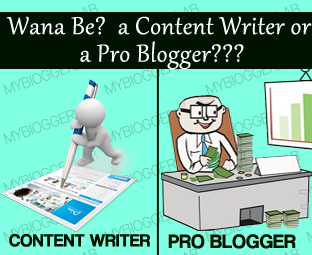 Now it totally depends on a person whether he is happy with Freelancing want to become a PRO Blogger. This would not only bring fame but will also increase his earning quite impressively. Who knows today’s content writer could become tomorrow’s PRO blogger. Those days are near when you will be hiring content writers for your site. It’s all about dignity and hard work. Very very awesome post by faizan. I love your blog you doing awesome and please keep it up.. I see you are a fan of Boardwalk Empire. Yesterday night was the season finale of the 3rd season. What season are you on and do they play it on TV over there? I forgot I read your site all the time for tips. What should he do, if he can manage his blog, but can't write for it? Thanks for Liking and Appreciating the Article. Well, If a Person has Developing Skills like you have then it wouldn't be difficult to write. I could give you Few tips that you could use to improve your writing Skills. 1. Just Write What you Love, Choose Simple words, Don't worry about the Vocabulary or anything. Just concentrate and write. However, if a person is still unable to write for his site then on this scenario he have to HIRE a AUTHOR because he can't write himself. I guess it pays to generate your own content. You are absolutely right. Many content writers like me spoiled several years in freelancing and now ventured in blogosphere. Anyway it is never too late. Thanks for such a wonderful post budy. Thanks for liking the article. And yes, A Content writer remains empty handled while the blog owner enjoys the wealth. the Owner Eat all the money. How are you dear brother?I just got free of uni stuff and visited MBL. Hmm,this is an interesting article for me.Well dear,I think that even writers can work less and earn well. It depends on the correct strategy. And yup,you can always hire an seo expert to maintain your blog seo and keep posting quality content if you are a good writer. I am Glad You took Time for MBL . I am Fine how about you. Hope The Uni Work is not too much. Yeah, Popular Content Writers can even earn 1000 Dollars per 10 Articles but for a new comer its extremely difficult. Take a good care of your self Sis. Blessings!